Synopsis: This is a humorous book masquerading as an instructional manual for would-be business executives. Balchin takes an imaginary bassoon-manufacturing operation as his starting point for a dissertation on all aspects of industry, with topics including motion study, advertising, incentives and welfare. 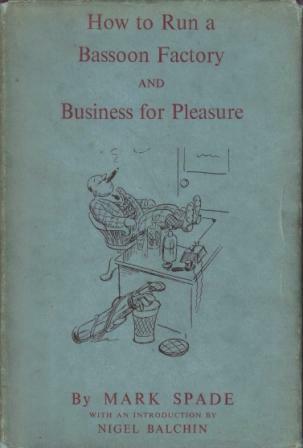 There is little differentiation between the ground covered by these two volumes, although Business for Pleasure (which is possibly the funnier book) deals more with general business principles, as opposed to the running of the hypothetical musical instrument factory detailed in its predecessor. Context: Balchin worked for the National Institute of Industrial Psychology from 1930 to 1935, being involved in many of the activities described in this compendium. Most of the material contained in these books had already been serialized in Punch during 1934 and 1935. The books originally appeared under the pseudonym Mark Spade so as not to offend the author’s employers. The whimsical tone used throughout these works never succeeds in disguising the kernel of solid good sense at the heart of most of the chapters. Availability: The original volumes (first published in 1934 and 1935, respectively) are virtually impossible to find. This combined volume (first published in 1950) can usually be tracked down without much difficulty on the Internet.